Starting with version 2.5, H-Sphere allows you to host your sites on dedicated servers. When you first sign up with a dedicated server plan, pick up a dedicated server from available templates or sign up without a server. Order a custom-built server or add a templated one right from your cp later. In the same way you can send requests for extra IPs, server upgrade, remote reboot and cancellation, as well as set up regular backup service. You can add a dedicated server from DS templates provided by your admin or send request for a custom-built server. If you are satisfied with the server settings, click Add. The server will appear on the Manage servers page. You can order a custom-built dedicated server by simply clicking a link only if this option is enabled by your hosting provider. Sending request for a custom-built server will issue a trouble ticket to the admin. Then you will get an e-mail with login, password, URL and IP for a new dedicated server. 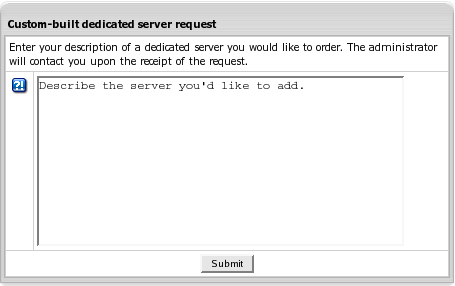 Select Send request for a custom-built server in Dedicated Servers/Add new Server menu. On the page that appears, describe the server you'd like to add and click Submit. Alternatively, you can simply send a trouble ticket to admin asking him about a custom-built server. Here you will see the list of your dedicated servers. Click a dedicated server name to proceed to the server manage form. 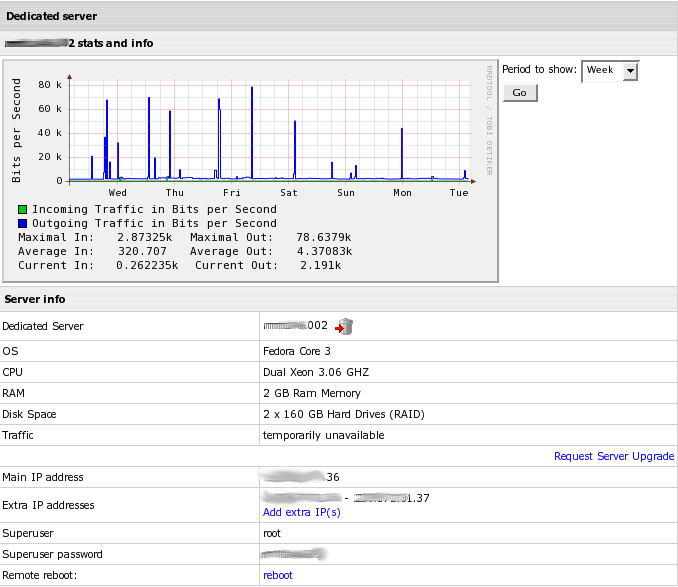 Note: You are not able to automatically manage dedicated servers. Instead, the system sends internal tickets to the admin, and the admin in turn carries out your requests manually. On the page that appears, click the Request Server Upgrade link. You will see the templates with available dedicated servers. 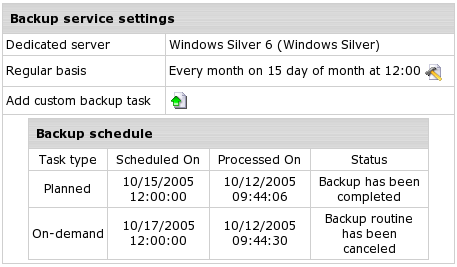 You may select the Get a quote for custom upgrade option and manually fill out custom server configuration. After you click Submit, your request will be sent to the H-Sphere admin. You will be notified about a charge for this upgrade. Fill in the number of IPs you want to add. Once an additional IP range is assigned to your server, you need to create reverse DNS records (aka PTR records) for each IP from this range. This is necessary for IPs not to be blocked by some e-mail internet servers which reject mail from IPs without such records. The newly added record will appear on the Edit IP range page. Important: Setting up reverse DNS records is implemented only for class C network IPs. Choose a preferrable option and press Submit. Then agree to be billed for the service. Your request will be sent to and managed by the admin. Choose a preferrable option and press Submit to send the request to the admin. This will issue a trouble ticket to the admin with your reboot request. Fill in the page with necessary information and click Submit. 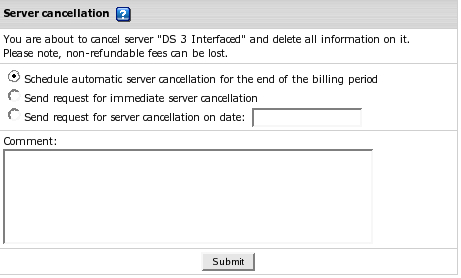 Click the Cancel Server icon again if you've changed your billing period and want your server to be cancelled accordingly, or if you want to send request for earlier cancellation. Send request for immediate server cancellation, Send request for server cancellation on date - troulbe tickets with these request will be issued to your upstream provider. Important: If you choose to cancel a server automatically and then change your mind to continue using it, inform the administrator about this ASAP. It is only the admin who is empowered to discard or postpone automatic cancellation of dedicated servers.